The first article called “New Paradigms of Popular Sovereignty in the Wake of the Arab Uprisings” by Paul Amar explains all the different forms of sovereignty that were happening in the Arab world. They look at a variety of paradigms which focused on authority, imperialism, history, repression, etc. One of the articles mentions the feminist organization and how they continuously fought back against the state to change moralism regardless of consequences. The second article explains the issues that arises due many places being regulated and privatized by the mayor. One of the cities largest park was even closed due to it being believed it would cause unwanted “political violence”. While reading the article I also learned how most of the state has regulation throughout the state by “privatization” of land. There are many places that have been closed to the general public and made private for example the Corniche which is a historical urban city is now commercialized and the marina called Zaytuna Bay as well. Putting so much restrictions on land that was public at one point puts a sense of sovereignty in the State and helps keep the citizens under control. The third reading we had to look at was on the trash issue in Lebanon. Before looking into the #YouStink campaign I never had heard of the movement and uprising that occurred in Lebanon during August 2015. The images that were taken and shown in the article really put into perspective the crisis the country was facing and how the government controlled its people. It is awful learning how other countries allow things like this to get so out of hand. The images showed how the police was shooting water out of canons and beating people them because they were rebelling against the trash issue. They wanted it removed because it represented the government failure and was causing health illnesses. Imagine if you lived in a country that would deny you basic rights? Of the readings, the part that stuck out to me most were the pictures of Lebanon, both the protests and the trash covering the streets. The people contest that the government is showing itself to be weak and inefficient if it is not able to properly carry out waste management duties for the country. The reading states that the main landfill in Beirut was closed down and since then the trash had been collecting for over a month. The article was from August of 2015. While I’d agree that the government of Lebanon is certainly failing to address some issues related their garbage, and more importantly their citizens, I also think that the trash crisis in Beirut is relevant to something other than rights and government abuses. I’m not sure why that landfill was shut down but it could have been that it was full. If so the Beirut trash crisis is more of a caution of human failing than just the government’s. People generated too much trash and people didn’t plan for what happened if the landfills they currently had weren’t sufficient to accommodate it. As landfills around the world fill up it seems only a matter of time before a similar situation occurs in another country. 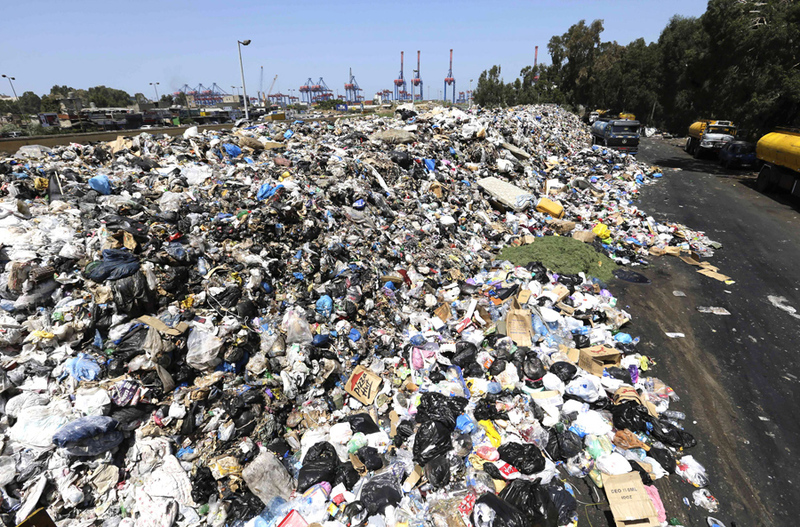 The Beirut trash crisis is just as much an environmental warning as it is an example of governmental neglect. The article that stuck out to me most was the first one, the one that pertained to issues surrounding the privatization of Dalieh. The article went into a lot of detail about how the area was public use and sovereignty could be defined as those who use a public space. However the property was still bought by investors and the communities surrounding it were bought out. It reminds me of the after Tahir panel discussion of the government and military working with contractors to gentrify the country. It seems something similar is going on in Lebanon. The YouStink campaign targets removing the garbage that the Lebanon government refuses to acknowledge. The movement has an active website that is published in two languages to accommodate both the locals facing the issue and those who are interested in learning more. Not only does it provide their mission and what they stand for as a group but also have direct links to social media accounts that provide even more opinions and information. What amazed me were the pictures in the article written by Taylor. It was powerful to see not only the amount of trash just there in the open, but how the protesters are dealt with. They are hosed down, beaten, shot at, and injured fighting for sanitation in their homes. You think that the government would take action to help the people. They are asking for a simple thing, which is to pick up the trash. Without following through the spread of disease as a problem arises. I put myself in their situation and it sounds horrible: the thought that trash would just pile up in the streets. The social movement in Beirut, mobilizing behind the hashtag #YouStink, began in the Summer of 2015, and calls for reform of Lebanon’s state infrastructure and an ousting of their current political leaders whom protestors argue are more concerned with capitalist corruption than the well-being of their own people. Following the privatization of Lebanon’s garbage collection services and the shut down of the country’s largest waste landfill, trash quickly began to collect on the streets of Beirut, leading protestors to organize in a call for government reform and the rights to a cleaner living environment. The main source of government corruption in relation to #YouStink is the relationship between the Lebanese government and the waste management company Sukleen. Sukleen has been dumping garbage in public spaces, and the Lebanese government’s completely apathetic response to this crisis has left the citizens of Beirut open to the exposure of disease caused by the multitude of waste being left to decompose in the open. It has been suggested that Sukleen has been allocated state funds in order to act as the country’s leading waste management system, yet they have been apathetic and willing to exploit the garbage crisis in order to obtain a contract extension with the government. Although the protests in support of #YouStink have aimed to be peaceful, violence has broken out as the government has sent out riot police with water cannons and rubber bullets as a response. Although #YouStink seems to resemble the activism and beginnings that we saw with the rise of the Arab Spring, its supporters seem adamant to distance themselves from being called revolutionaries. Uprising in the Middle East has generated high controversies. They created models to fight against the social polarization of the political-economic contexts. Basically what they wanted was the down of the regime and in a way I can understand this because being young, trying to go into the “real world” working and becoming independent and at the same time facing what they see as absolutism and oligarchy. The only option they have is to go out on the streets and join each other as a group based on the trends and beliefs they share, to try and change their countries. To this you can add the “#YouStink” campaign which activists participated complaining to the Lebanese government and accusing them of infecting the country with too much garbage. Activism happens everywhere and in Spain a year ago a crisis like this also happened and the garbage men stopped collecting all the garbage on the streets and these accumulated all over the cities of Spain. Activists ran out to the streets to complain however it never got as degrading as it did in Beirut in 2015. This is very shocking as people are not allowed to complain and speak their minds. It’s a two way thing but if the population would manifest in a peaceful way and the authorities would allow this then everyone will at least be free to say what they wish and at least feel like someone hears them. The way that it’s done in these countries just infuriates the citizens even more. Getting shot sprayed with a powerful water jet or even being beaten up by the police is not acceptable in any way what so ever. Reaching an agreement with the population where they don’t start a fire with anything and the police act more peacefully then maybe some solutions will be taken into consideration. According to Paul Amar, the Arabs’ uprising which includes Algeria, Egypt, Syria, Iran, Marocco , Libya, Bahrain, Tunsia and Yemen, led to a generation of social movements and public intellectuals that documented many of the Arab crises and their backstory. Some of these individuals tend to form this piece of history as a models of sovereignty. These paradigms include absolutism and oligarchy, and Ecocentric topics like the theories of the Middle East. Individuals from the uprising generation is constructing their own a rray of researched based on the past and current events within the Middle East and some of North America. These models become framework for hopes of a more fair and organized system that might serve as resources to moments that a country might never want to go mack to. #YOUSTINK is a antigovernment protest in Beirut,Lebanon that raised awareness of the dangers of the misplacement of garbage in Lebanon. Protesters and residents of Lebanon are concerned of the health problems that can be caused because of this essential garbage issue. The organizers of the #YOUSTINK campaign implemented to demonstrate a peaceful protest down the streets of Beirut, until riot police responded in violent actions such as firing tear gas, rubber bullets and spraying protestors with water cannons. As the days of protesting continued, the violence took an increase as riot police began to beat protestors with batons. Such violence demonstrated the corruption of the system that called for protesters to encourage others to revolt against it. Yet after long days of violence and protest, the system hasn’t implemented an organized process on how to deal with the inefficiency of the garbage management in Lebanon. Due to the numerous people that were injured the days of the protests, protesters postponed any further demonstration. The class reading, New Paradigms in Sovereignty in the Wake of the Arab Uprising by Paul Amar was exceptional. His writing truly exemplified the state of sovereignty issues in the aftermath of the Arab uprisings. The social context of mobilization and the social movements that have been scholarly debated since the Egyptian insurgencies, are well addressed by Amar and fully established within the structure of his argument. His provocative views on the balance of aspires between the many groups of intellectuals and theorists, abound by their social and economic pursuits, provides vision for the future of citizenship and workable sovereignty at hand. While the shifting of authoritative power can encourage influential effects, appeasing the engendered, against those with deeper conceptual perspectives, could work to empower the oppositions towards intervention and socialization. In relation to previous social and political successes, in the Arab world, the innovative and conceptual frameworks that oppose the extraneous injustices of autocratic control, can help to preserve the resolve of possible sovereignty for the Arab people. Conversely, the scholarly revolution that has arisen from the social insurgencies of Egypt and the protests against the failures of the Lebanese government, may also help to infuse the erudite perspectives of a more forgotten and understated educated youth, who have the knowledge and experience to better advocate against the potential reemergence of political and economic challenges. I think that it is important that the theoretical contributions of both the socially and educationally empowered elders and youths of the Arab countries, could work together to define what is possible for an intellectually driven modernization of Arab democracy, against the engrossed authoritarian regimes of the past. With the possibility of sustained social equality that is without violence and conflict between civilians and police, it is highly beneficial that solidarity and commonality be given emphasis in difference to the ambiguities of the contending perspectives on what is considered victory for the oppressed and persecuted peoples of the revolution.